After six years in captivity, the U.S. believes journalist Austin Tice is alive. The FBI is still chasing down leads, including from his fellow journalists, but the U.S. "has every reason to believe" Tice is still alive and being held captive in Syria, said Special Presidential Envoy for Hostage Affairs Robert O'Brien in his first public remarks on the case. Also on Tuesday, several groups announced a new effort to raise money to increase the reward for information leading to Tice's freedom. 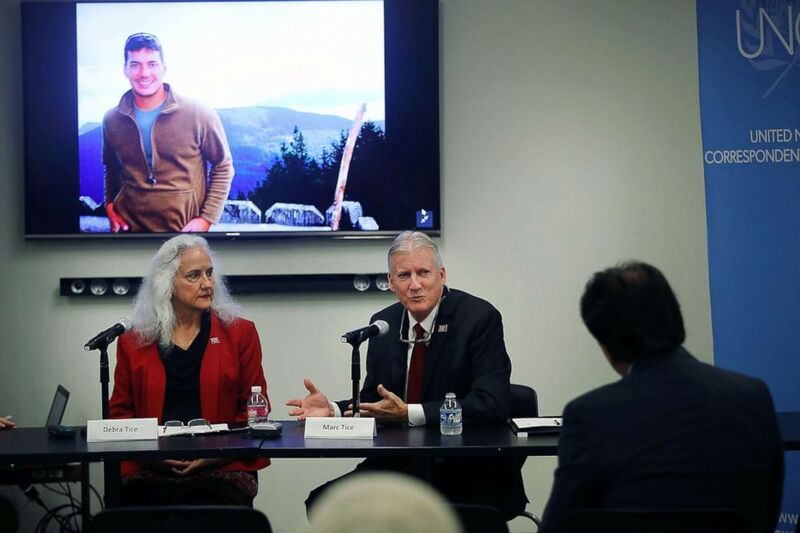 (Spencer Platt/Getty Images) In coordination with the United Nations Correspondents Association, Reporters Without Borders and the Committee to Protect Journalists (CPJ), Marc and Debra Tice hold a news conference about their missing son American journalist Austin Tice, Sept. 17, 2018 at the United Nations in New York. O'Brien would not say who the U.S. believes is holding Tice, but he blamed Iran for detaining several other U.S. citizens and not being helpful with Tice's case. The Iranian regime has supported the government of Syrian President Bashar al-Assad with troops and weapons throughout its conflict. Tice is believed to have been kidnapped by pro-Syrian regime forces while he was covering the civil war in August 2012. Over a month after he was taken, a video was released, showing him blindfolded, removed from a car, and led by armed men up a hill, saying "Oh, Jesus." "The Iranians are not helpful, and they're heavily involved in Syria," said O'Brien, a lawyer who served in the Marines, advised Mitt Romney and Scott Walker's presidential campaigns and now, as special envoy, leads diplomatic efforts to free Americans unjustly detained abroad and work with their families. A State Department spokesperson later told ABC News that O'Brien "did not intend in his comments to link Iran to Tice's disappearance." While Tice has not been heard from publicly since that 2012 video, O'Brien declined to say whether the U.S. has received any additional proof of life, instead referencing Tice's physical fitness and age. Still, the U.S. is "deeply concerned" about his well-being, O'Brien added. While President Donald Trump has never publicly commented on Tice's case, O'Brien said the president has been briefed regularly on it and would take steps to publicize Tice's case if it helped. Secretary of State Mike Pompeo has been "intimately involved" in Tice's case, O'Brien said, including meeting with his parents. U.S. Ambassador to the United Nations Nikki Haley has also been leading efforts, in particular working with countries at the U.N. who could help pressure the Syrian regime to assist with his case, like Russia. "We continue to call on the Russians to exert whatever influence they can in Syria to bring Austin home," said O'Brien. "It's something the United States would be grateful for." Because the U.S. closed its embassy in Damascus, the U.S. works through the Czech Republic "to obtain information about Austin Tice's welfare and whereabouts" within Syria, another State Department spokesperson told ABC News. Also important to these efforts is an FBI reward of $1 million that was announced in April for information leading to Tice's safe location, recovery, and return. O'Brien said it was an important tool that has helped in other American hostage cases. Tice's father Marc and National Press Club President Andrea Edney announced a new campaign to raise up to $1 million to add to the FBI reward. Next year, restaurants in the Washington metro area are set to partner with the Free Austin Tice coalition and donate a portion of their profits on a "Night Out for Austin Tice" to the reward fund. Set for May 2, 2019, the date is the eve of World Press Freedom Day, and Edney said they hope to expand the event nationwide. "We know Austin longs to walk free. 2,282 days," his father Marc said, referring to the number of days his son has now spent missing. "Austin urgently needs to be freed. Maybe soon." Marc and Debra Tice, his parents, will make another trip to the Middle East this month -- at least their seventh -- as they search for a breakthrough on their son's case. And they will again apply for visas to Syria while they are in Lebanon to try get close to where their son is being held.